This quest may have some sort of (quest/zone) barrier as it was not available to me directly after handing in the one for rank 1. Will try to update when it becomes available to me. The prerequisite to this quest is Trapos rasgados de seda, which starts from Trapos de Seda Rasgados. If you have rank 1 Aethril, this will drop randomly while gathering Aethril with a rather small chance. I had about 180 Aethril in my bags when I finally got it, so it takes a while. I got mine at about 54,17; right next to the withered area. Since the quest has to do with the withered, this might not be a coincidence. 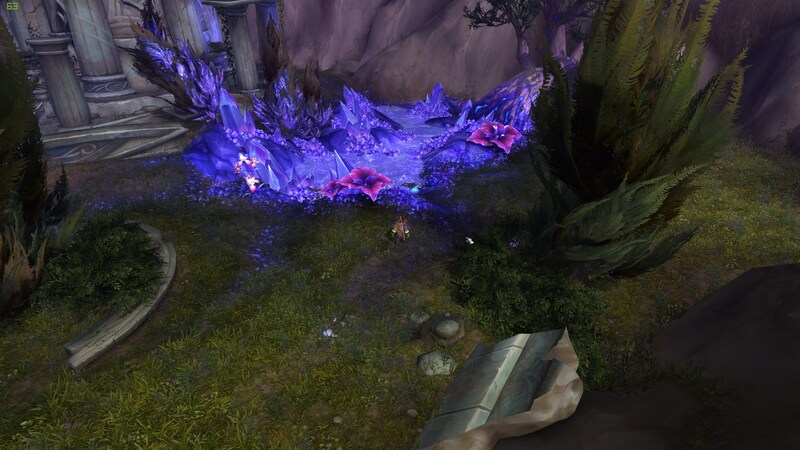 If you're looking to learn Aethril, your best bet is probably to farm Aethril near withered in northern Azsuna. As for the quest itself, simply go to the marked areas in Azsuna and kill/loot withered, drop rate is very high. Good spot to farm them. Desperation may breed Ingenuity but what is for sure is "Sloppiness Breeds Inefficiency"...Major Malcolm Powers, USMC. - Heartbreak Ridge. Not sure if this is a bug or not but farmed this just by killing the withered in the Ruins of Zarkhenar. Just killed them until I had all 6 chewed stems. I did several loops around Aszuna herbing and never noticed that the mobs were tagged as quest mobs for this quest. the quest item is dropped by the Withered mobs, not obtained through Aethril nodes. I think someone is joking ...a lot, i killed a million withered scavengers and nothing, after a small investivation, i noticed that this quest item doesnt shot on the drop table of this mob. Obtenha 6 Caules Mastigados de Aethril com os Fenecidos em Azsuna. Acho que podemos usar essa pista a nosso favor, <name>. Os fenecidos são notórios pela sede de mana, e fazem qualquer coisa para conseguir. Talvez a gente possa estudar como eles usam a aethril e usar os resultados para melhorar nossos próprios métodos de colheita. Fico feliz que você continue vindo à minha loja, <name>. Sou inútil com uma arma. Precisamos de aventureiros como você para resolver casos assim. Se você perdoar minha linguagem, eles realmente mastigaram esses troços pra cacete.